Over the past decade, voice technology in distribution has risen from a niche solution used primarily in the grocery and food service industries to a mainstream technology deployed by hundreds of companies in almost every business sector. The benefits of voice are simple to understand. Because DC associates receive instructions and confirm what they have done using voice (a voice-enabled terminal connected to a headset with a microphone), they operate "hands-free" versus using a traditional radio frequency terminal (RF). Without the need to manage a terminal and frequently look down at the screen for the next instruction or to make sure that the last bar code scan was verified, productivity in many tasks (e.g., order picking) can be increased, often by as much as 20-25%. Because the basic fields and transactions are already integral to the WMS, as VoiceExpress translates the data to and from voice, the WMS really doesn't know it is now supporting voice processing - and doesn't have to. Most voice users also report improvement in accuracy gains, among other advantages. With these kinds of benefits, why don't even more companies jump on the voice bandwagon? The effort it takes to connect voice to some warehouse management systems is often a key factor. While today most major warehouse management systems have developed pre-built voice interfaces for tasks such as picking directly into their solutions, that only helps companies that have a fairly new version of the WMS with that native voice support. But even then, usually just a few operations have been voice enabled, meaning there might be IT work required to voice-enable another application not supported out of the box, such as receiving or cycle counting. And of course, literally thousands of DCs are running home grown, "legacy" or other WMS technology that doesn't support voice at all. To add voice to these systems usually means using the voice vendor's own software subsystem to manage the voice transactions, interfacing that subsystem to the WMS. While this approach certainly works and has been successfully deployed by hundreds of companies, there is usually a not insubstantial level of IT work required. The problem goes beyond just the cost of that work, because the project will usually return a healthy ROI even with the IT-related costs. Often, the issue is one of pure IT resource availability. The engineers over at Vocollect, a leading provider of voice solutions that was acquired by Intermec in 2011, has just released an innovative new solution that can significantly change the status quo with regard to connecting voice to WMS or other systems that lack voice support in total or for specific tasks. Called VoiceExpress, the solution comes with one caveat: the transactions being considered for voice enablement must have associated RF transactions. That is because Voice Express piggybacks off those transactions to insert the voice interface - and can sometimes even improve the transaction process itself along the way. It works like this (see graphic below): The Voice/Express system can in effect capture the RF screen sessions from the Telnet interface running on handheld or truck mounted RF terminals. It is a similar process to what is called "screen scraping," a technology that has been around for about 20 years, but Vocollect says the much better term for what it does is "screen mapping." That's because VoiceExpress takes a more intelligent approach than traditional screen scraping uses, enabling a major benefit of the system. Often, existing RF screen flows have some inefficiencies, and/or can be combined for better process flow. VoiceExpress enables users to make those sorts of changes that can drive additional productivity over just exactly copying the existing RF process using voice. Because the basic fields and transactions are already integral to the WMS, as VoiceExpress translates the data to and from voice, the WMS really doesn't know it is now supporting voice processing - and doesn't have to. Major WMS systems have been supporting RF since the early 1990s or even previous, so a high percent of older WMSs still in the field have that RF support. 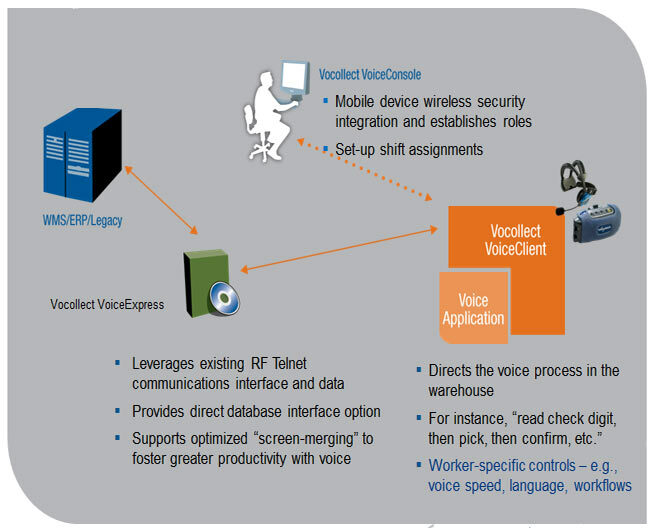 VoiceExpress comes with a tool kit that enables Vocollect, its reseller partners, and its customers themselves to develop these voice enablements in a "drag and drop" type of environment. 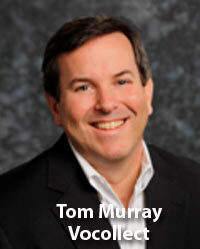 VP of product management Tom Murray told SCDigest during a recent briefing on the solution that the technical work using VoiceExpress to enable say voice picking is usually only a matter of a few days, though obviously the full project will take a bit longer to define the work flows, test, train workers, etc. However, that can be just a fraction of the time and cost of the normal approach to integrating voice with a legacy WMS. Vocollect says it is in the process of training many of its current systems integrators to be able to deploy VoiceExpress. Murray also said that if a company is going to deploy VoiceExpress at various sites, it could work with Vocollect or a partner to learn how to do it over the first couple of installations, then do further rollouts themselves. A frequent question how the system will handle use of check digits, used in many applications to confirm the worker is in the right location.Vocollect says there are several approaches, including support for check digits found in some WMSs, or a simple check digit table that could be constructed in the VoiceExpress application. Bottom Line: Vocollect emphasizes that VoiceExpress is just one of an array of integration options it has available, and that if your current WMS has support for the transactions a company want to voice enable that is usually the way it would want to go. That said, VoiceExpress is a smart innovation that gives lots of distribution operations another path to voice-enablement that simply didn't exist before, and one that looks to make the job much easier for many of them than existing choices to date. VoiceExpress is live at grocery chain Giant Eagle, and Murray says Vocollect is seeing strong market interest in the product. What do you think of this approach to enabling voice technology in existing DCs? Let us know your thoughts at the Feedback section below.